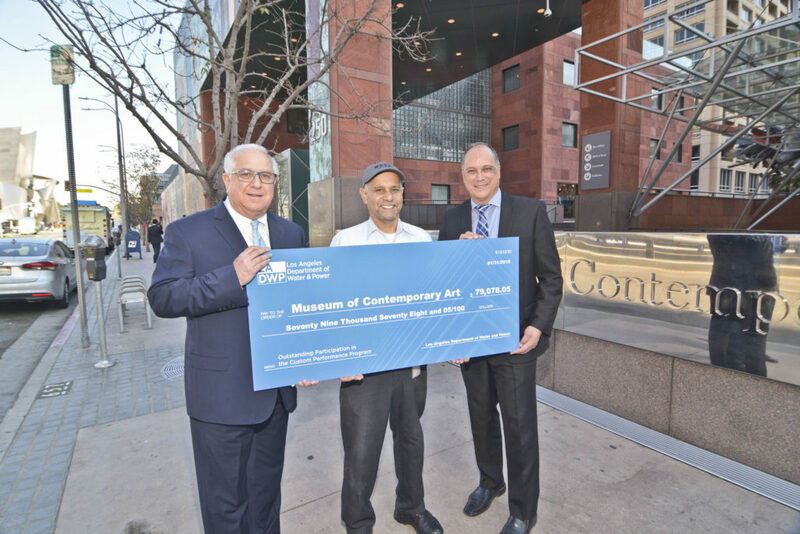 LOS ANGELES (February 8, 2018) – The Museum of Contemporary Art, Los Angeles (MOCA), located at 250 S. Grand Avenue, has earned $79,078 in rebates from the Los Angeles Department of Water and Power’s (LADWP) Custom Performance Program (CPP) for the installation of energy efficient controls and upgrades to its heating, ventilation and air conditioning (HVAC) system. MOCA is among several LADWP commercial customers that are saving energy and money on their electric bill by partnering with LADWP to reduce electrical energy use in their buildings. By participating in the program, MOCA will save an estimated 527,187 kilowatt-hours (kWh) annually, which is equivalent to removing about 42 homes in Los Angeles from the electric grid on an annual basis. LADWP’s CPP helps businesses reduce energy costs through an array of energy-efficient measures such as HVAC and refrigeration upgrades, installation of energy efficient equipment, controls and lighting and thermal energy storage. Increased efficiency often leads to long-term savings in building operation costs while increasing comfort in the facility and benefiting the customer’s bottom line, while helping reduce overall energy demand around the city. The many upgrades implemented by MOCA include the installation of high-efficiency supply and return-fan motors, variable frequency drives and new reconfigured heating and cooling coils. MOCA also installed digital data controls and a new energy management system, along with replacing existing evaporative pad humidifiers with a high pressure fog system on their air handling units that service galleries and art storage. Another energy efficiency retrofit nearing completion at MOCA is the replacement of more than 350 halogen lamps in its gallery to new energy saving LEDs. 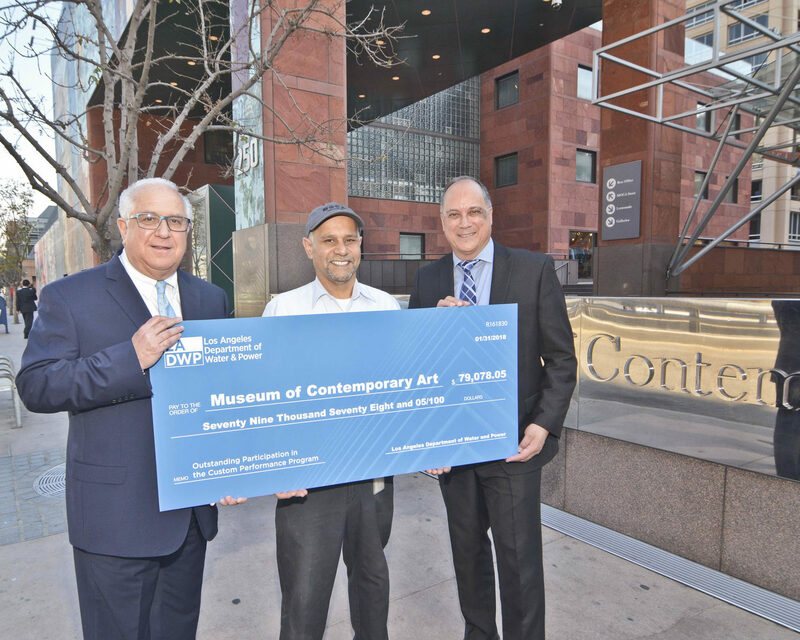 The project is estimated to save over 123,000 kWh per year, potentially earning the museum an additional $9,800 in incentives through LADWP’s Commercial Lighting Incentive Program (CLIP). In December MOCA completed an LED retrofit to all non-gallery spaces as part of the Commercial Direct Install (CDI) Program. LADWP has proudly partnered with several of Los Angeles’ iconic cultural institutions to help them save both water and power. Cultural venues often face unique challenges in regards to lighting and humidification when safeguarding the integrity of their artwork and displays. With today’s technology, museums and galleries no longer have to sacrifice efficiency for design. LA’s cultural institutions have proven that and serve as a valuable role model for others throughout the country to emulate. LADWP puts customers first by offering CPP, CDI, CLIP and many other rebate and incentive programs to help customers reduce their energy use while also saving on their bills. To learn more about LADWP’s commercial rebate programs visit www.ladwp.com/cpp or call 1-800- DIAL-DWP. Founded in 1979, MOCA’s vision is to be the defining museum of contemporary art. In a relatively short period of time, MOCA has achieved astonishing growth with three Los Angeles locations of architectural renown; a world class permanent collection of more than 7,000 objects, international in scope and among the finest in the world; hallmark education programs that are widely emulated; award-winning publications that present original scholarship; groundbreaking monographic, touring, and thematic exhibitions of international repute that survey the art of our time; and cutting-edge engagement with modes of new media production. MOCA is a not-for-profit institution that relies on a variety of funding sources for its activities.